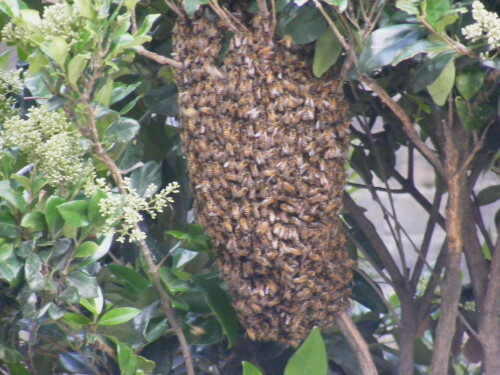 Websites about bees suggest ringing the council or police who will know local beekeepers who could collect the swarm. I spent 15 minutes on the line to the council call centre, but the guy didn't really understand what I was talking about and eventually said that pest control would look at it in five working days. So I rang the swarm helpline [I didn't know such things existed] of the London Beekeepers' Association and a helpful man said he'd come and check it out. Just been past and the swarm has gone. Given the problems the poor bees have these days I'm delighted the few swarms left have the good taste to swarm in Bermondsey and I hope the bee keeper folk find them a good home! Thats the trouble with call centres James, they only have standard information on their screens, when I worked on a council switchboard we had little black books in which every operator compiled lists of enquiries that were asked and had no obvious links to internal extensions. We had everything in them, from beekeepers who would collect a swarm, to chimney sweeps,fox rescue and chemists with late night hours..plus all the operators were local! What's so difficult to understand about "there's a swarm of bees"?! Was English his first language? Glad to report that Royal Festival Hall hives doing well. Trainee beekeepers were taken up there by LBKA experts last week and observed that all was fine. I have been trying to spot the hives from across the river - my imagination keeps on trying to morph air-conditioning units into hives - but no luck so far!